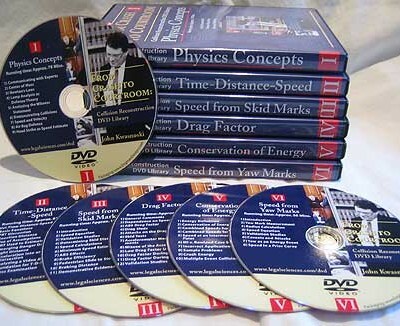 A series of six DVDs of the Lethal Weapon – DWI Homicide lectures delivered at the National Advocacy Center. Ideal for those who wish to refresh their knowledge of collision reconstruction principles and the presentation of expert testimony at trial. Titles include: Physics Concepts, Time-Distance-Speed Analyses, Speed from Tire Mark Evidence, Drag Factor, Multiple Event Collisions, and Speed from Yaw Mark Evidence.